The smog billowed from the tinplated smoker. The setting sun made the smoke glow as if swallowing the hovering bees. The white haze quickly encased the boxes as dark shadows scurried behind the scrambling insects. Chaos ensued within the hives. Welcome to a meeting of the Lehigh University Beekeeping Club. 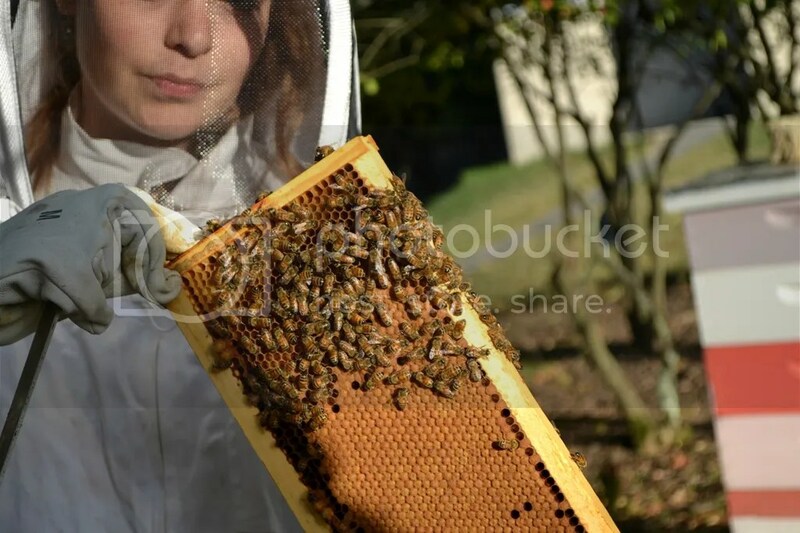 Lehigh’s Beekeeping Club is in its third year and keeps growing in size. They are now up to forty members. 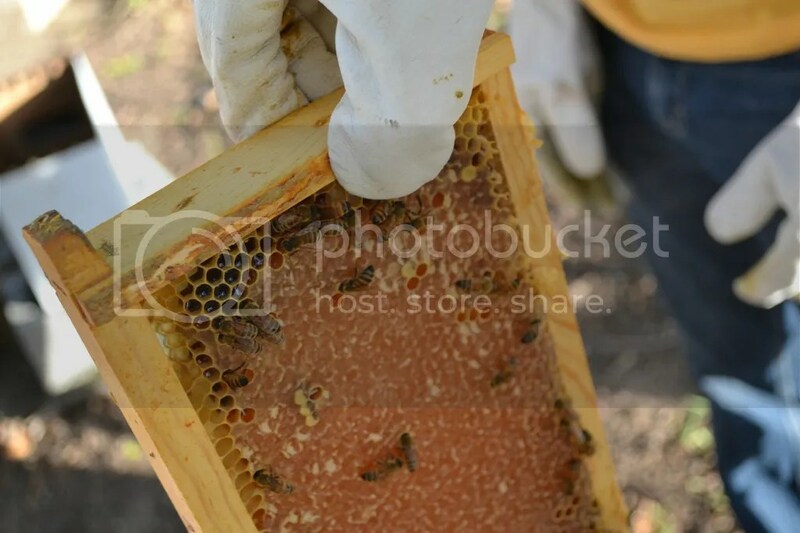 The Club works to spread awareness of the dying honeybee population and environmental sustainability. To do so, their approach is very hands-on. 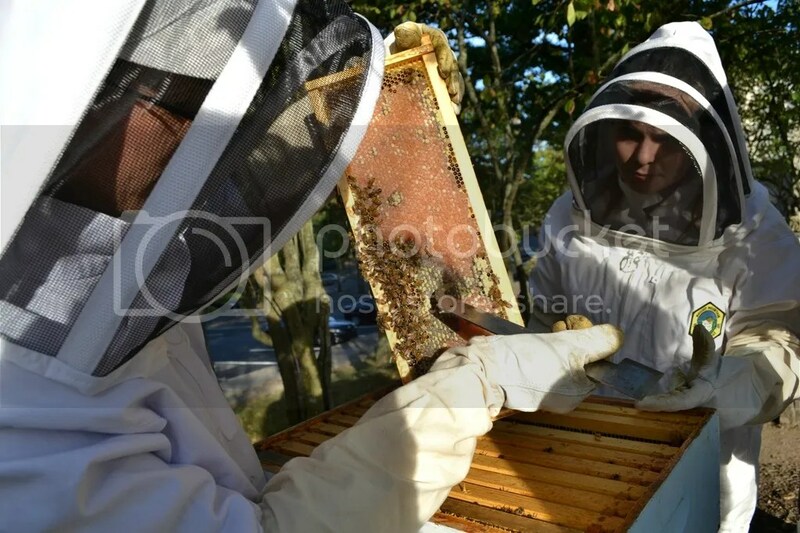 Members of the club assist in maintaining the University’s hives and analyze the actions of the colony. 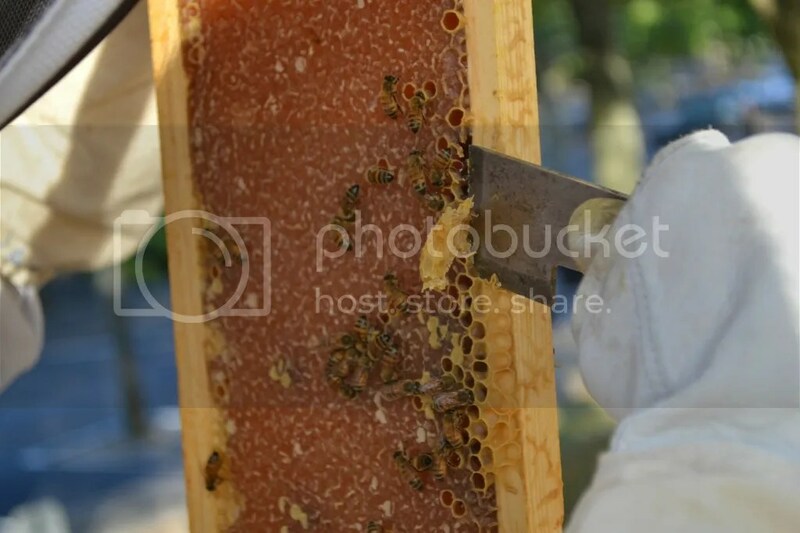 They also harvest the honey! Sweet, huh? 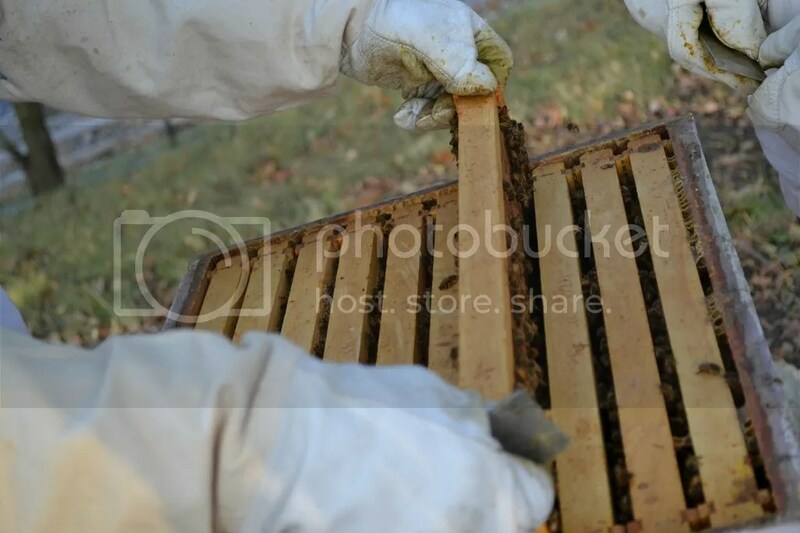 I represent that I am physically fit and prepared to tend hives of bees and that I am prepared to use necessary equipment (e.g., a smoker and hivetool) in tending bees. I understand and accept that the risks of participating in this Activity, including, but not limited to, being stung and serious bodily injury. 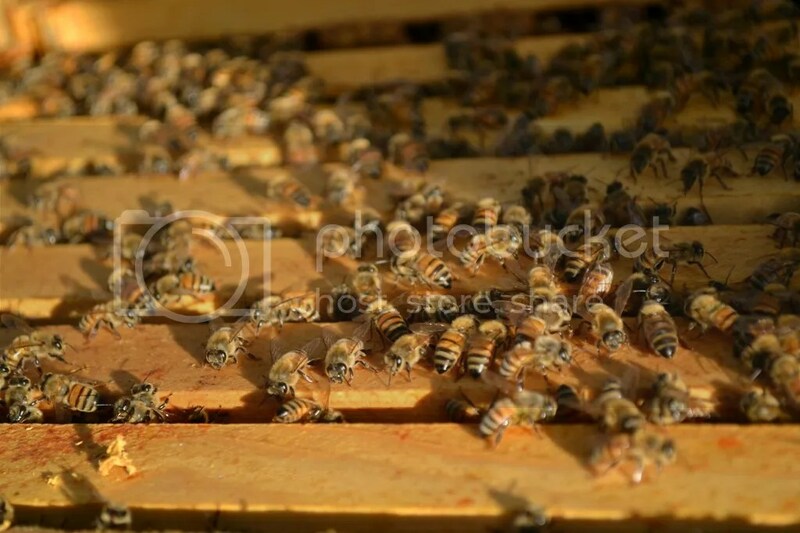 I also affirm that (1) I am not allergic to bee stings or (2) if I am allergic to bee stings, my participation in the Activity will not involve getting in close proximity to the club’s apiaries. Other instructions were to wear a long sleeved shirt, pants (keeping ankles covered), and no open-toed shoes. Once acknowledgements and precautions were covered, it was time for clean-up day! 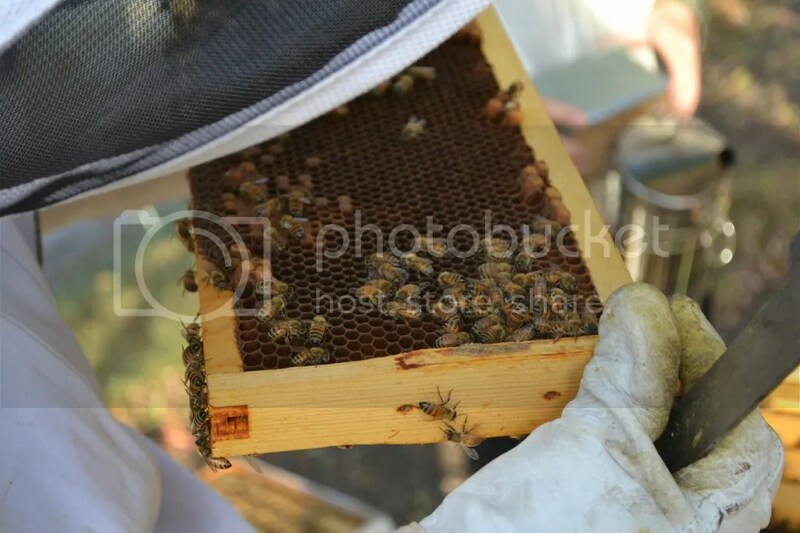 The Club also utilizes this time to check-up on the bees and honey formation. So let’s see what all the buzz is about! The meeting was held on Lehigh University’s Mountain Top campus. There, nestled between the parking lot and Iacocca Hall, are honeybee colonies: two towers of boxed hives. 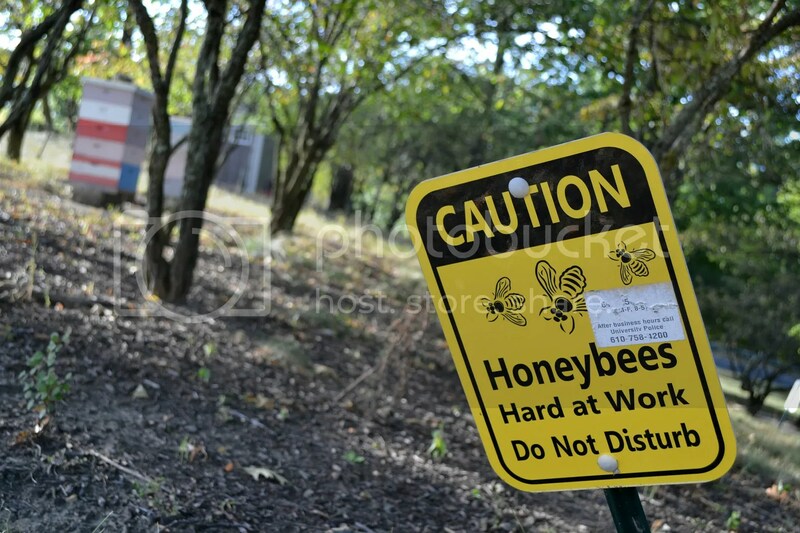 Signs are posted with Caution Honeybees Hard at Work Do Not Disturb messages. 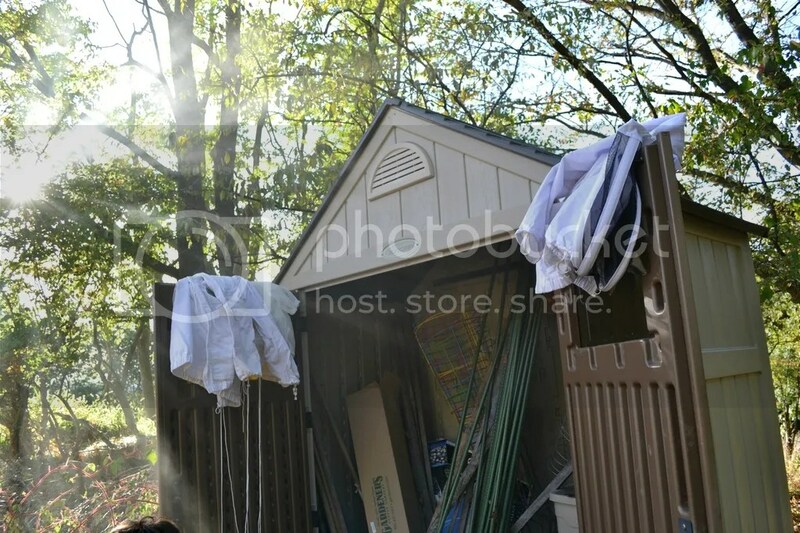 At the end of the row of trees sits a shed with all the supplies. 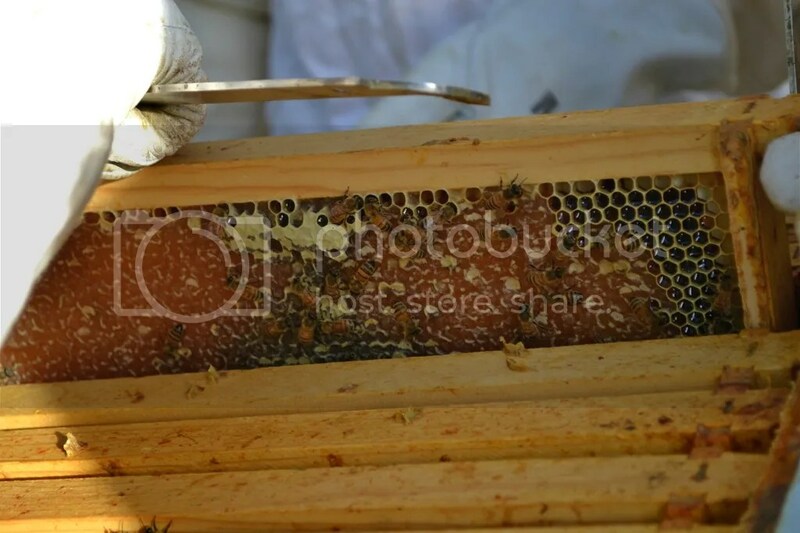 MASKING SMELLS, especially alarm pheromones released by guard bees that are injured in a hive inspection. 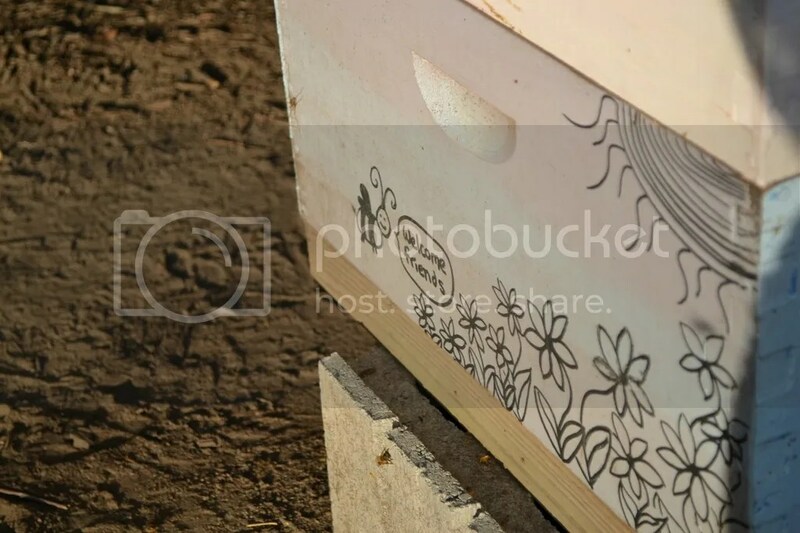 TRIGGERING EMERGENCY RESPONSE to abandon the hive because the bees speculate a fire. Another emergency response is over consumption. 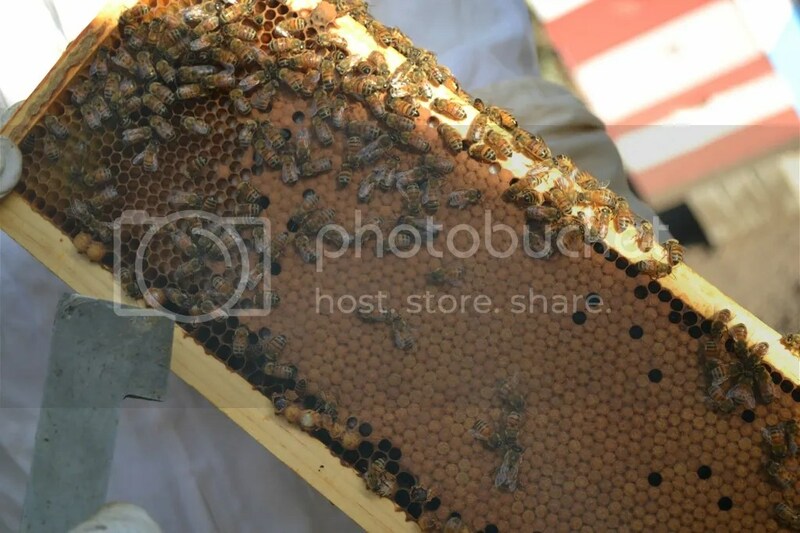 In fear of the colony collapsing due to fire, the bees feed on the honey making them lethargic (think of how you feel after Thanksgiving dinner). This makes them less likely to get agitated enough to sting. 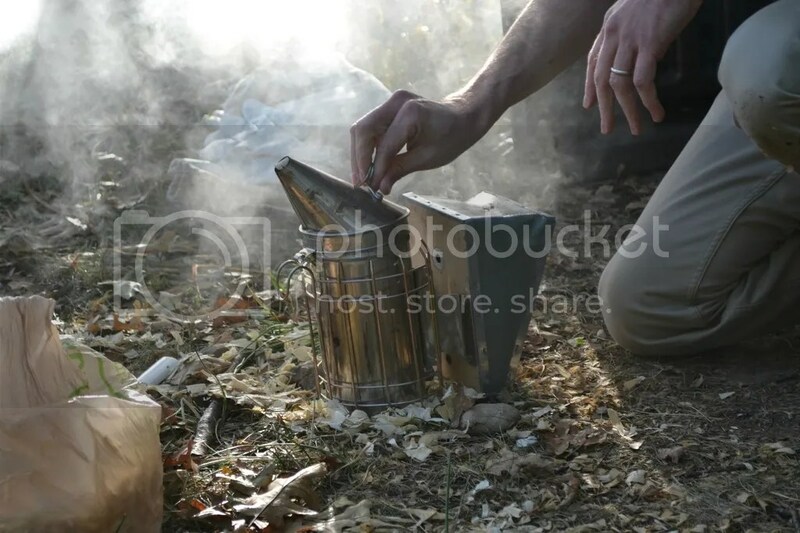 The smoker is a can-shaped tool with a cone top and bellows on the side. To prepare the smoker, it is first stuffed with fine wood chips and lit aflame. The flame is then pumped with strong bursts of air from the bellows, creating a smolder. 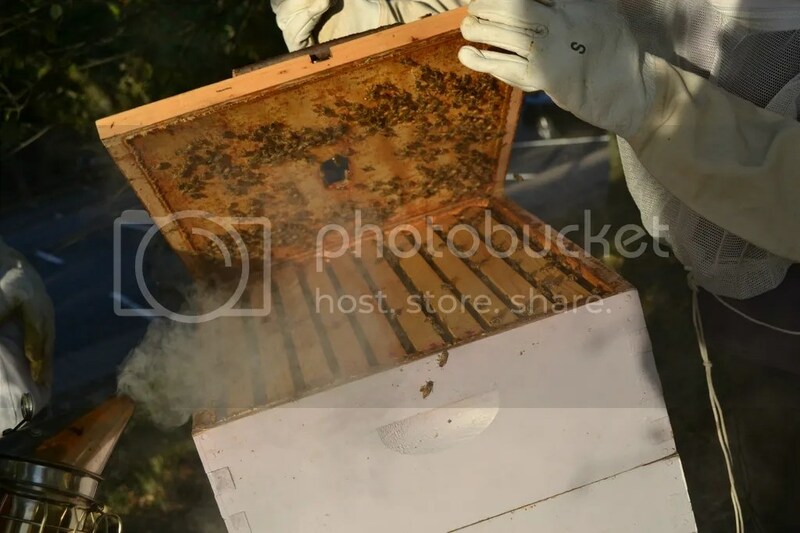 Not all beekeepers use smokers, but it is the preference of many. The next step is dawning some bee apparel: an Inspector’s Jacket and goatskin gloves. The Inspector’s Jacket was similar to a hoodie. You pulled it over your head, but the hood was a helmet with a mesh-screen face. There was also a drawstring at the base of the coat to tighten around the waist. This eliminated the likelihood of a bee flying up into your jacket. The gloves also acted a barrier as they were tall and covered a majority of the sleeves of the jacket. Now we were ready to approach the colonies. Two towers of boxes were bordered by a lane of trees. Each tower was five boxes high. To inspect, smoke is puffed around the tower to ward off the guard bees. The top cover is then taken off to reveal the first box to the open air. Within each box is a row of frames. 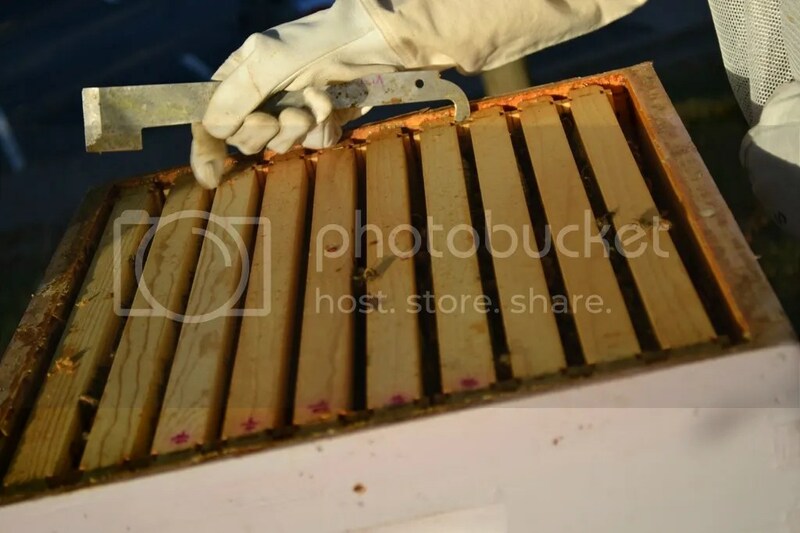 Using the hivetool, similar to a putty knife, the sides of the frames are scraped of any wax, burr comb, or propolis. Once removed, the frame is delicately lifted from the box to clean and inspect. 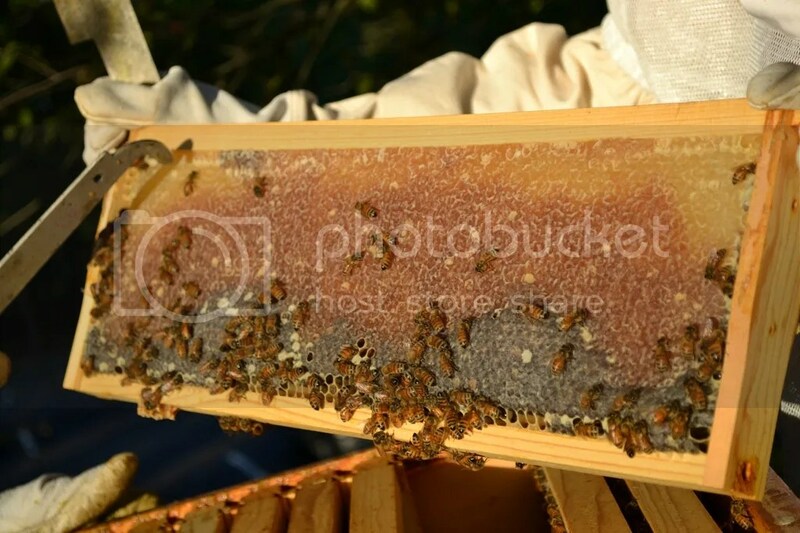 Each frame contains comb, honey, eggs, and hundreds of bees. Due to this, each can be pretty heavy! It was riveting to watch what goes on in a single frame. One, seeing the bees feed on the honey while in disarray. Two, the intricate patterns of honeycomb. And three, the gorgeous hues of different cells in one comb. 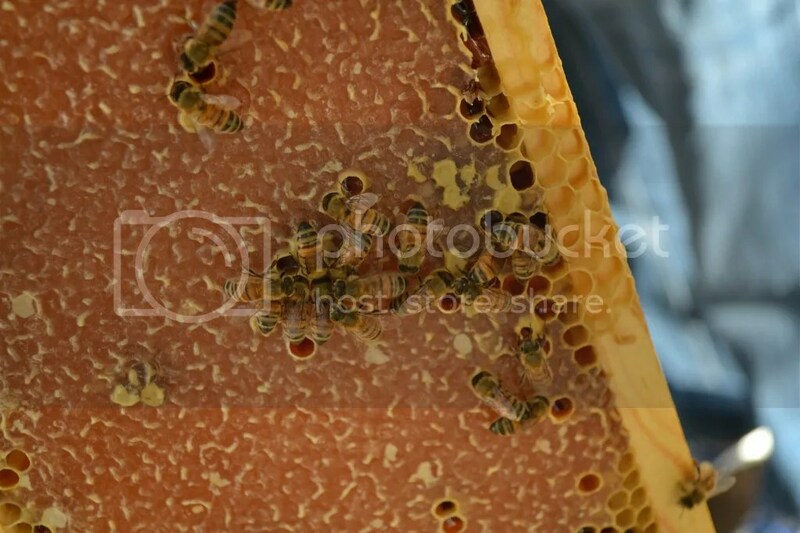 A great source to further explain all the cells you see can be found on BackYardHive.com. 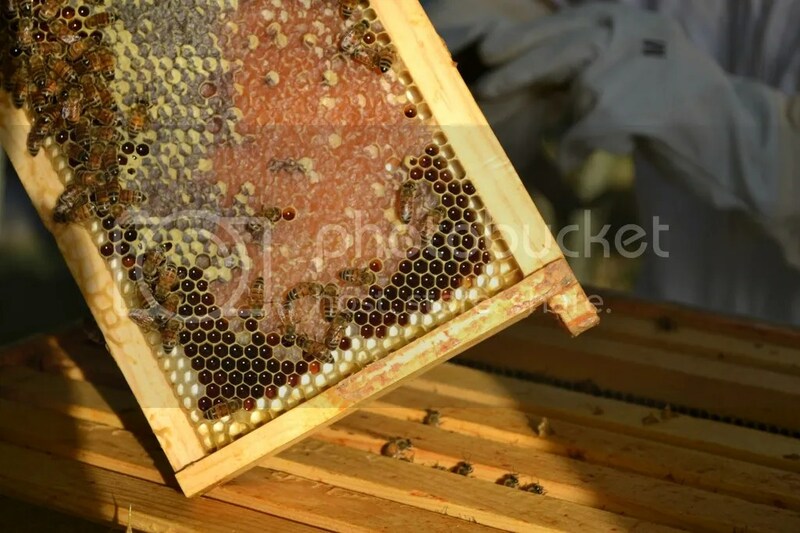 Another fascinating aspect was the role of the honeybees in the colony. As mentioned there were guard bees, worker bees, drones (or “nuggets” as the Club dubbed them because they were fatter than the workers), and then the queen. Each tower of boxes has its own queen. The Club’s queen was marked with a blue dot. As each frame was inspected, it was pertinent to place each back from where it was pulled to cause as little disruption as possible. The Club tries very hard to not have any fatalities on clean-up days. They were very diligent in reassembling the boxes as to not squish any bees. It was endearing watching dozy bees crawl along one of the member’s gloves and there was no panic. 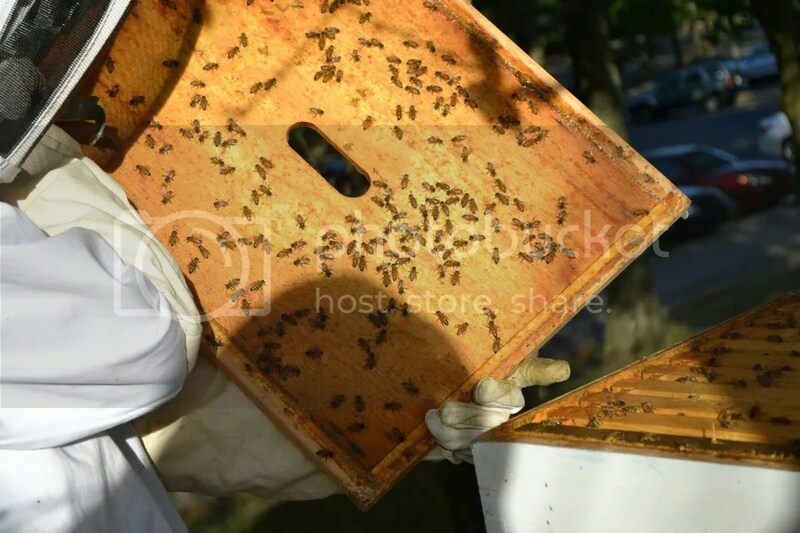 These bees are the Club’s pets to tend and care for. Their passion was evident as we searched for the queen bee among hundreds as the sun set on the mountain. It was the needle in the haystack, the blue dotted queen in the hive. We did find the queen after rigorous digging and squinting in the dusk! As the sun faded the cleaned boxes were reassembled and gear returned to the shed. We left with one souvenir! 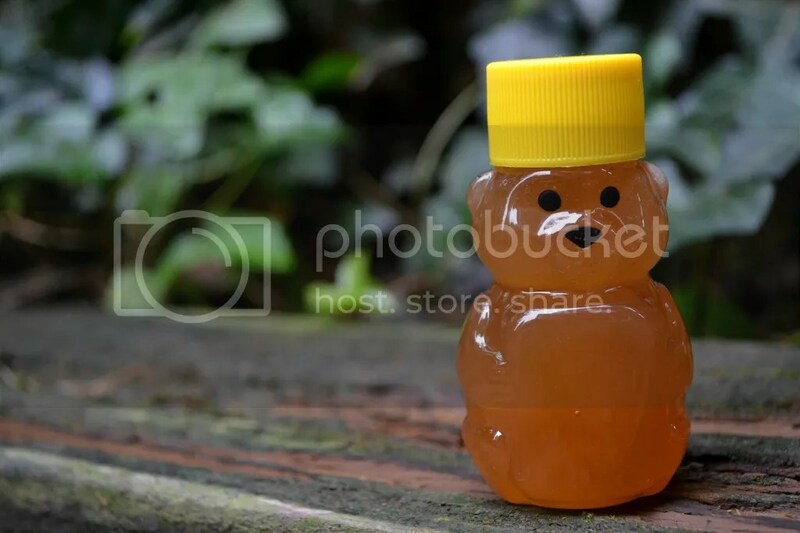 No, not a bee sting, a honey bear! I have so many great photos to share! Be sure to check Facebook this week for a new album!